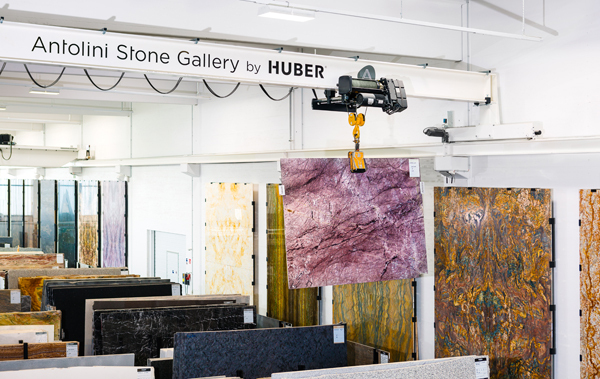 Huber Naturstein, the German partner of Italian natural stone dealer Antolini, has added a crane from Stahl-und Kranbau Oeder, crane-building partner of Stahl CraneSystems based in Southern Germany, to its showroom. The crane was installed to improve the use of space and exhibit slabs in the narrow area at the back of the building. The prerequisite for the enlargement was an overlap area served by both cranes as it was wanted that slabs could be transferred from the existing crane in the wider, front part of the hall to the new, narrower crane. Stahl-und Kranbau Oeder extended the existing crane runway on the full-length side of the hall wall and constructed a new 27m-long crane runway in the narrow part, protruding 3.3m into the wider part of the hall. “The challenge here was that the overlapping part of the crane runway had to be a self-supporting structure so that Huber can use the area underneath for its exhibits without supports getting in the way,” said Rudolf Lang, managing director of Stahl- und Kranbau Oeder. The aisle in the overlap area simultaneously serves as connection to the adjacent hall, with rail cars being used to transport the stone slabs to it. In designing the overlapping crane runway, Rudolf Lang's team had to consider a further aspect: the gap between the existing crane bridge and the new crane runway had to measure at least 0.5m. This meant the crane runway protruding into the room had to be installed at a lower height and the crane pulled up on this side accordingly – an unusual solution that Stahl- und Kranbau Oeder had already implemented in similar form elsewhere. Wire rope hoists from the SH series from Stahl CraneSystems serve as lifting equipment on both crane bridges. The company also supplied other crane components such as control equipment and crane endcarriages. The new storage area obtained offers space for more than 40 additional materials.